Most of this is fluff. However, federal contractors are now (finally) prohibited from discriminating on the basis of sexual orientation. It begs a more basic question. If someone has the qualifications for a particular position of employment why would anyone not hire them because they are gay and married? What possible difference does it make to an employer even if they are religiously conservative? Years ago the same people made the same arguments about Jews. In certain industries it was impossible for a Jew to obtain a managerial position. That, too, was predicated on the religious freedom of Christians to discriminate. If there is a difference between not hiring a Jew for not accepting Christ and not hiring a gay person because they are in a marriage that someone disapproves of, I fail to see it. Nobody is being “targeted” for their beliefs about marriage or just about anything else. We live in a free country. “Common sense and fairness” should mean treating fellow citizens with respect, dignity and equality regardless of their sexual orientation of sexual identity. 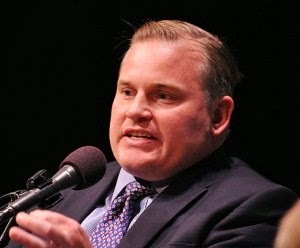 NOM is a proxy for the United States Conference of Catholic Bishops. The Church should, for its own sake, stay out of American politics and law making. Most Americans would agree with that. 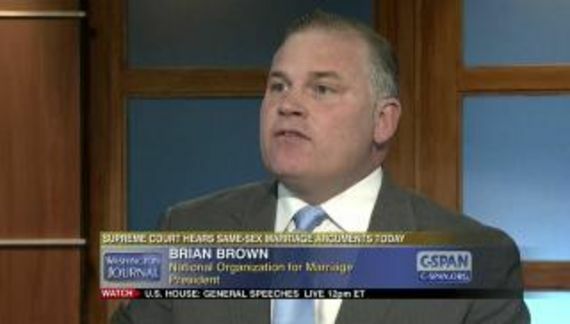 Brian S. Brown would not. Backholm: They are going to jail your pastor, close your church and take your kids away from you!! !